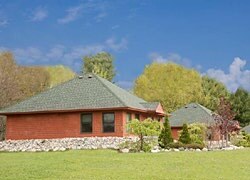 Come enjoy the beauty of Northern Michigan at Coyote Crossing Resort! Stay in one of our deluxe cabins and dine with us at our Bar & Grill. We are the closest resort to Caberfae Peaks Ski and Golf Resort. Here you can enjoy the thrill of the ski slopes or the tranquility of golfing amidst a pine tree forest. We have ten finely-crafted, deluxe cabins. Each one has two bedrooms with a full bath, living room, fully equipped kitchen, Satellite TV, Wi-Fi access and individual patio. With two bedrooms and a pull-out sofa, all cabins can sleep up to six people comfortably. Our resort has direct access to over 300 miles of extensive groomed snowmobile trails.